Paul Solomon was an inspired and illuminating teacher of life’s sacred mysteries. He was a scholar of comparative religion, sacred scriptures and the Qabalah, plus arcane wisdom and ancient mystery traditions. He was a leader in the field of altered states of consciousness, and many people called him “the modern-day Edgar Cayce.” Paul was uniquely skilled in making complex concepts nderstandable and applicable, while still allowing for deep understanding. Through his lectures and channeled readings, he made universal laws and esoteric doctrines practical to daily life for people around the world. Through lectures, seminars and residential programs, Paul sought to bring together people of diverse nationalities, races and religions under one roof, believing that perfect love, beginning with oneself, is humankind’s only appropriate response to the world’s challenges. His primary focus was the establishment of a worldwide family – plus the empowerment of individuals toward their full potential, enhanced through an intimate and interactive relationship with the source of their being. Until his death in 1994, Paul continued to share the message that each of us can choose love over fear every moment of the day, thus making the choice to live in heaven on earth, on both a personal and global level. 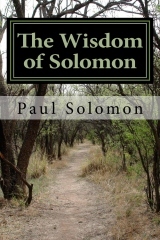 The Wisdom of Solomon is a collection of Paul’s teachings on spirituality and religion, mysticism and occultism, prayer and meditation, reincarnation, channeling, dreams and the mind-body-spirit connection. Paul’s vast knowledge base, combined with his gift for simplifying issues and spelling out practical steps toward transformation, make The Wisdom of Solomon unique.